Which Portable Recorder to Buy? Quick: which brand-new portable recorder will be your long-awaited iPod of recording? The newly-announced M-Audio MicroTrack, or the already-proven Edirol R-1? One thing’s for sure: CompactFlash is where it’s at. I just got an email from Buy.com offering a full 2 GB of CompactFlash storage for US$70 after rebate. You’re likely to run out of battery life — or whatever it is you’re recording — before you run out of space. And drag and drop is so much better than the old way (dealing with MiniDiscs, DAT tapes, and the like). So, based on some feedback from readers, I may have to upgrade the CDM rating on the MicroTrack portable recording device from ‘HOLD’ to ‘BUY.’ Street price is looking like it’ll hit around US$400. See Sound Professionals for that pricing plus the spec sheet that still (goshdurnit) isn’t available on M-Audio’s site. 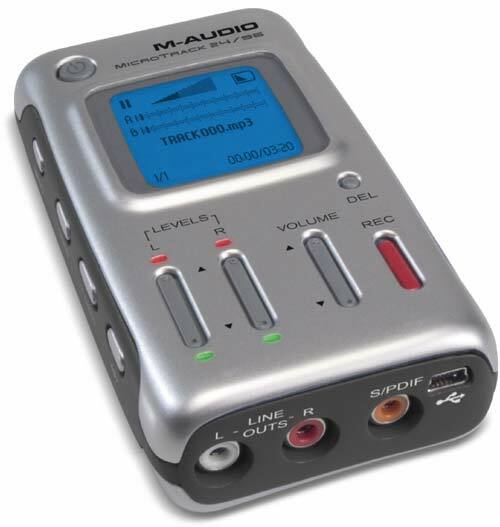 MicroTrack edge: M-Audio’s device is small and has a cute iPod-like LCD display, plus a digital input for direct-digital recording. Edirol R-1 edge: The defending champion of this product category may be clunky, but it has built-in stereo mic and integrated software mic models, effects, metronome, and tuner. Which one do I want? I’m leaning towards the M-Audio because of its smaller size, but we need to see a shipping model before anyone can say anything authoritative. Bottom line: Finally, we may be able to throw away the DAT and MD recorders.